Some might say that in a world that is arguably defined by a complex set of global challenges (think food security, transnational organised crime, antibiotic resistance, sustainable development, etc.) you might think that the fate of a few trees in a post-industrial city in northern England is hardly worth the political equivalent of a raised eyebrow. You would be wrong. Political science is dominated by concerns regarding the ‘end’, ‘death’ or ‘suicide’ of democracy and books that highlight the rise of anti-political sentiment and ‘disaffected democrats.’ The crisis narratives are arguably now so ubiquitous and levels of political trust amongst large sections of the public so low that they no longer tend to provoke shock, or even concern. Crisis, it would appear, is the new normal. But in Sheffield a very abnormal political crisis appears to be unfolding. Abnormal because no one can really understand why the situation has been allowed to occur, but what is clear is that local confidence in local politics has been shaken to its very roots. This is a storm that is currently raging in what was once a proud civic city, a steel city, and a green city, but has recently become something of an international laughing stock in terms of local governance. From healthy street tree stock to political laughing stock…. The story? In 2012 the Labour Council signed a 25-year Private Finance Initiative with a private company called Amey for pavement and street maintenance worth £2.2 billion. This contract was supposed to put Sheffield ‘Streets Ahead’ when it came to paths, pavements, and roads, but quickly degenerated into chaos and blame games as Amey implemented a rather draconian approach to tree care. Put very simply, where a mature street tree has required some form of maintenance or the street or pavement has required even the most minimal and perfectly common re-engineering, Amey has come along and chopped it down. Local communities have understandably protested against this approach but councillors blame the ruling Labour group, and the Labour group blames the PFI contract. But still what the Secretary of State for the Environment described as ‘environmental hooliganism’ has continued. So far nearly 6,000 trees have been felled in the city and a recent Freedom of Information request has revealed that under the contract 17,500 must fall. If the use of dawn raids and the arrest of OAPs in order to fell perfectly healthy trees was not enough – a situation the local MP and former Deputy Prime Minister Nick Clegg said was like something from Putin’s Russia – burly private security guards now protect Amey’s tree surgeons (and are themselves surrounded by legions of police officers who I am sure have better things to be doing with their time). From Green City to Stump City in the shake of a chainsaw. Now let me get three things straight: 1. I am not a tree hugger and have no history in environmental campaigning; 2. I am not a member of a political party and have no partisan affiliations; 3. Local politics generally bores me rigid. However, with that all out in the open I have to admit that as a political scientist the Sheffield Street Tree scandal – and it is a political scandal – is by some way the most interesting, revealing, and worrying political saga I have studied in over twenty years. Everyone is ‘up in arms’ –local communities, the Police and Crime Commissioner, South Yorkshire Police, the national Labour Party – all for being dragged into a very public dispute that never needed to happen. Correction: Sheffield City Council claims it does need to happen because re-negotiation the PFI contract would be too expensive. But having studied the Sheffield Street Trees saga through a mixture of participant observation, ethnographic methods, interviews and documentary analysis over the last 12 months, what is most interesting is the manner in which the focus of the protestors has evolved. As many ‘active citizens’ have told me – ‘It’s not about the trees’. It was, but is now about the failure of local democracy more broadly and particularly about what is perceived to be a disconnected and disinterested local political elite that treats the city as a fiefdom. The silver lining is that the controversy has mobilised the public, it has spurred civic engagement and activity in ways that would not have happened without the chainsaws and security specialists. The Sheffield Tree Action Groups now contain more than ten thousand members, crowd funding has raised money to pay for legal reviews, festivals, and events have been held to raise awareness, beer has been brewed and the public pressure and media interest shows no sign of relenting. From small acorns mighty oaks will grow…. Featured image credit: In Bloom Sheffield by dom fellowes. CC-BY-2.0 via Flickr. Matthew Flinders is Professor of Politics at the University of Sheffield and is President of the Political Studies Association of the United Kingdom. He will be appearing on stage to discuss the politics of Sheffield’s Street Trees with Jarvis Cocker at an event outside Sheffield City Hall on Saturday 7 April 2018. 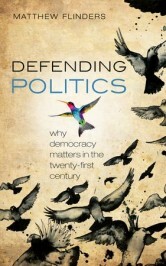 He is the author of Defending Politics: Why Democracy Matters in the 21st Century. Think you have got it spot on by suggesting that the trees crisis is more important than it first appears. When we first started it was just about the trees, now it is not just about the trees! Indeed it might not be about the trees at all. As a community activist this is the most important campaign that I have been involved in since….well take your pick! Thanks v, much for interesting and informative background to, and comments on, this considerably distressing situation; need I however be concerned that it was published on April 1st…? All good wishes, Sue. It certainly is the most polarising issue that I can remember in Sheffield for many a year (I haven’t been studying through participant observation – I just live here) although for you to claim that it is the “most interesting, revealing and worrying political saga” you have studied in 20 years is either hyperbole or your academic career at the PowerPoint face of politics has been disappointingly lacking in insight. Still with plenty of skin in the game I do agree that it is an issue about local democratic accountability. Personally I was consulted on my road, gave a reply and am broadly happy with the programme of works enacted (apart from the daft re-positioning of a lamp-post). Lots of people’s experiences will be different. Let us not pretend that it is binary issue – for or against – it is more complex than that. Last week I was in London and noted a disparity between Kensington and Chelsea and Westminster in managing street trees. K and C are big on pollarding (noted around Notting Hill where more money was probably spent on the trees than fire safety in social housing) Whereas the 160-70 year old planes and limes in Westminster are now taller than 6 storey buildings and will require some serious interventions at some point. Maybe Sheffield is onto an issue that is coming to parts of London some-time soon. It appears that decision-makers in the council and its contractors did not appreciate how important trees are, for the environment and for people. The lack of flexibility in such a long PFI contract is also a big concern given that there will probably be many changes during the life of the contract. Pity that local politics is seen as boring. Watched closely over many years I suggest that what has happened is that Sheffield has been so desperate to regenerate along all too familiar lines (attracting inward investment, the tussel with rival city Leeds, “Sheffield Open for Business”) since the collapse of it’s traditional industries. As such the leaders of the city have thrown caution to the wind and opened it’s doors wide open to an unaccountable corporate business. So desperate that this PFI contract is ‘self monitoring’. Pleas for caution before going down this route were ignored over the five or six years before 2012. Canadian activist Naomi Klein has recorded similar tales of loss of democracy across the world due to predatory companies stepping into the breach at the point of crisis. Sheffield is paying the price. However all is not lost with the rise of the 10,000 strong Sheffield Tree Action Group and its many determined activists. Any truth in a fringe story that Sheffield trees are being felled to benefit the 5G trials soon to take place across the city? Search Ian R Crane on YouTube talking about Sheffield Trees, 5G, and Joining the Dots. Just to say having been involved from the beginning, it was never just about trees for me and many others. It was always about the lack of democracy, lack of accountability, lack of understanding of environmental issues, lack if understanding of peoples needs in a polluted urban environment. It was about a paternalistic set of Councillors who acted like an outraged Victorian parent when its child, (us voters ) dared question the parental judgement. Whilst some of the behaviour of some Cclrs had been appalling, slurs, lies, etc. Really nasty stuff. But the current council systems processes we have encourage and enable poor behaviour. In elections its all about winning, or loosing, like a game, not about representation. If you want an experience more bizarre than Alice’s when she fell down the rabbit hole, go to a council meeting. They are not for the faint hearted! Did you know quite recently ‘they’ changed things in full council to make it harder for smaller parties to be heard? (Thats on top of them talking out opposition motions of course) Not many people do, its not very interesting is it, democracy facing further erosion. Its what ‘they’ count on.